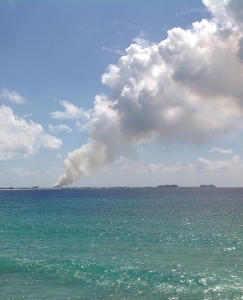 (CNS) Update 5pm: Local firefighters on Grand Cayman have now managed to get the George Town dump blaze under control. The fire-fighting crew has been working at the site since they were alerted to the fire at around 6am this morning when it began smoldering but then later ignited into a much larger blaze. Officials recommended those living near to the dump to leave the area and the fire service called in all off-duty personnel to help with the ongoing battle throughout the day. Although all available resources were used to fight the fire, as it was extinguished in one place it recaught in another because it was deepseated underground in the heart of the landfill. Officials said changes in wind direction also caused further blazes. With additional fire trucks arriving mid-morning, the fire was contained and has not spread to any surrounding areas. Fire Services and DEH staff said they would continue their efforts to control the fire until it has been extinguished. The areas around the fire have been saturated to prevent it from spreading into additional on-site waste. The Department of Environmental Health (DEH) offered its apologises to the public for any inconvenience that may have been caused by the fire, and the minister emphasized his gratitude to the hardworking firecrews. This latest blaze comes in the wake of a fire which took hold of tyres located at the dump (a.k.a. Mount Trashmore) just a few weeks ago and following the announcement by the ministry that a committee has been formed to assess the way forward for the island's pressing waste management problem. Don't worry the fire is contained…….. To the dump, cough cough splutter. Where's my gas mask? Ozzie owes his job to the dump and he and everyone else knows it. Unfortunately he has already decided to keep the dump at its current location so he has decided himself already. What is the committee expected to do? CONTAINED??? All of Industrial Park is blanketed in smoke right now (13.02 12:00PM). It's inside the office and people are choking. It's a simple PPM solution: All George Town residents simply need to move to Bodden Town. And move the tourism industry and financial industry to Bodden Town, too. Let George Town become the toxic waste district. George Town voters have no one to blame but themselves. The PPM said it was going to keep the dump in George Town and they have. Now people need to live with the consequences of their political allegiances. People will organise protests, petitions and marchs over the moving of a road, over potential real estate developments, over bringing captive dolphins here, but George Towners don't seem motivated to put any pressure on Government to do anything about the biggest potential health and economic disaster this country has ever seen. Until that changes, governments aren't going to be motivated to do anything but use delaying tactics and organise committees to study the problem over and over and over again. Camana Bay School Closed (CIS) Wonder what all the financial white collar firms at Camana Bay think? The situation is much worse at the school than in Camana Bay. I drove through Camana Bay on the way to the school this morning — though you could smell the smoke, the air was fairly clear in front of CIS. At the back of the school, in contrast, the air was so thick and acrid you could barely breathe. My eyes and lungs began to burn within seconds of being there. I was really surprised at the difference, to be honest. The smog is blowing straight through the football field and towards the classrooms. Not very good for developing lungs. I believe that any parent who enrolled their child there was well aware they were placing their child next to a drump. But I suspect the local private schools were no longer "good enough" for their children. A lot of children went through other local private schools and have gone on to become major contributors to this community. There were and are still good enough, it is simply a matter of our PRIDE getting the better of us. I believe the developer was smart enough to know he was purchasing inexpensive swamp land next to a growing dump. The developer CHOSE to build there. Does it not make you wonder why? Wonder if they still feel this way, 24 hours later and most of the west bay Pennisula is buried under smoke. Good thing the wind will pull around to the north and north west, should give downtown and southsound a taste of it too! Who cares about West Bay and Camana Bay and a rich kids school… good thing it's not Bodden Town. KEEP BODDEN TOWN DUMP FREE!!!!!!!!!! How about us GT'ers just ban BT, NS and EE'ers from bringing their garbage to this side of the island? Let the new and old garbage trucks turn around at Countryside and come back? You are all part of the problem but have no solution. Typical of everything in Cayman. Good Ole Caymanian Common Sense from the Sacred Vessel. I shudder to think of the Class Action suits resulting from this fiasco. That it burns like NOAH’S flood 40 days and 40 nights. This is a right shame! As of this morning at 7AM Thurs 13th in Snug Harbour the smoke was still hovering you couldnt even walk your dg without a respirator! For so many years fightin and bickering over politics instead of dealing with the problem. I can see five years from now we will still have the same CRAP! burning dump, stinky smell and the Directors & Poiticians making statements with no teeth in them! If a smaller terriory like Bermuda could get it right with a proper waste facility shame on Cayman for still having this mess as we are no poorer than Bermuda to afford such a facility. Really starting to believe the conspiracy theories that someone is setting these fires to have the dump moved. What an absolute disgrace. I'm embarrassed to be a resident of Cayman. I live on SMB and got home tonight stinking of smoke. Way to go Cayman – what great advertising for being a third world country. Move to Bodden Town and you won't have to worry! Really, contained it did they? So how the hell at 10.30pm the air is full of acrid smoke and the vis reduced severely…this is BS people. "Officials are recommending those living near to the dump to leave the area…"
Hmmmm, "near to the dump" on a small island like Grand Cayman probably means everyone. The government should evacuate the entire island. The politicians (past and present) can be put up in the Brac at the Hurricane Hilton. They rest of us can be put up in hotels in South Beach, Miami. Really and go where exactly?!!!! At least it gives the firemen something to do. Most of the time they are inactive as the call out statistics show very clearly. Lick it out with your cow cod, Ozzie. There does not seem to be any other strategy. This is remediation of the dump cayman style! Big bon fire! You know what befuddles me….it's Cayman's "winter". Much cooler now than the summer. I too have to wonder if these fires are being set. Can we hear from the Minister, please…or at least the head of the committee? This is horrible..Where is our Government today? Four cruise ships in town and smoke engulfing them…Moses maybe you need to speak to Ozzie about getting that committee working right away… We can't take another two years of inhaling this crap..
Ozzie you sure you need the committee or do you just need to get on with it…This will be your death knell politically…Unfortunately for you this will be your legacy..NMot a good one I am afraid. Remediation by Fire…Gotta make room somehow…. Move the dump to Bodden Town!! Someone started it this time I am sure. Who? Ozzie fiddles while the dump burns. Mt. Trashmore is saying "bring it on!" to Ossie and his committee. I am beginning to wonder if someone is not being paid to set these fires!! The firemen who the public has been cussing for standing up to their rights should all call in sick and let it burn until nothing is left. That would be a good way of getting rid of the tires and other rubbish in one swoop. getting rid of the rubbish….. and our tourists as well while poisioning our residents….hmmm…yep sounds like a great idea…NOT! There is nothing "natural" about this fire – it is the result of man made incompetence. So man is not part of nature? You wouldn't say that if you knew what is in that pile of trash. This isn't a bonfire. There are plastic compounds that produce dioxins, wood treated with arsenic, rubber products and who knows what else burning there. That smoke needs to be analysed to find out what it's polluting the ground and sea with. Get all of the technocrats together and brainstorm over this problem. I am sure they will be able to solve this never ending problem with the right solution. Start thinking out of the box and come up with a Solution, we separately need one. "Earning their missing back pay". That seems to be a contradiction in terms. If it's back pay it has already been earned. just wait for that dump to really catch on fire….you will not be counting hours but couting weeks and weeks instead. That is a ticking timebomb filled with methane just sitting there.